The Feedback Studio tool allows instructors to leave their feedbacks on their students' submissions, once the post date of a paper has passed, students are able to access any grades, comments, or requested changes noted by the instructor. From the Assignment Inbox, click on the blue pencil icon to start grading the student's submission online. The QuickMark Manager stores every QuickMark that you have created besides the already existing QuickMark sets that the Turnitin Feedback Studio provides in Composition, Composition Marks, Format, Punctuation, and Usage. Each set contains a number of comments to assist you as you provide student feedback. Click the QuickMark icon from the blue grading toolbar to open the QuickMarks side panel. Click the cog icon from the QuickMarks side panel to open the QuickMark Manager. Click anywhere on the paper and select the QuickMark icon. Follow the steps above in 1 & 2 to access the QuickMark Manager. Click the menu icon in the top left-hand corner of the QuickMark Manager & choose Create new set. Enter a title for the QuickMark set in the text box, and then click Save. The set will then appear in the menu. Choose a set from the menu. Hold the Ctrl key (Cmd on Mac) to select multiple QuickMarks. press the + Add to Set link. 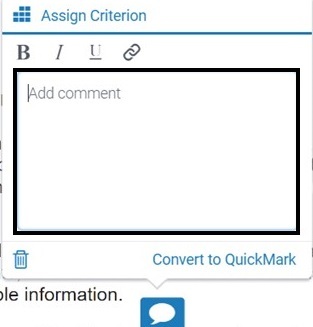 Ensure the QuickMark set that you would like to add the new QuickMark comments to is selected from the menu icon. Click the + icon to add a new QuickMark comment. Enter a title and description for your comment, then click Save. Ensure the QuickMark set from which you would like to edit a QuickMark comment is selected from the menu icon. Select the name of the QuickMark you would like to edit. Click the pencil icon in the top right-hand corner of the QuickMark manager to start editing then click Save to confirm your changes. 1. 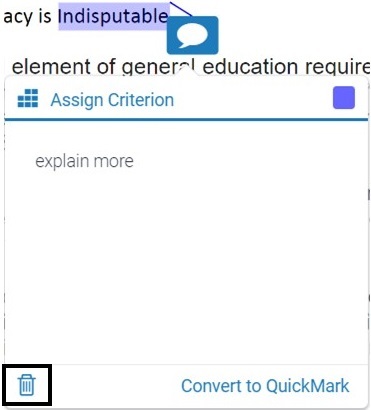 Click on the QuickMarks icon from the blue Grading toolbar. 2. 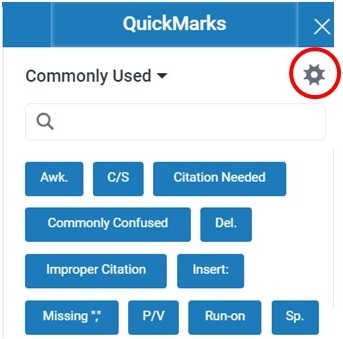 Select a specific set or use the search box to search for a specific QuickMark. 3. Drag your QuickMark from the panel and drop it into the relevant part of the paper. 4. To leave a comment together with your QuickMark, click your QuickMark title on the paper & scroll down & click on the Add comment to begin typing, then click outside of the comment to save your comment. 5. A comment left alongside a QuickMark. 2. Click the trash can icon in the bottom left-hand corner of the QuickMark box to delete it. 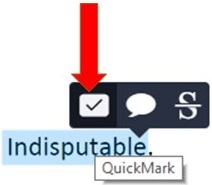 Select the part of text you would like to associate the QuickMark with & click the QuickMark icon. Choose your preferred QuickMark to leave it on the paper. If you would like to leave a comment alongside your QuickMark, click your QuickMark title & scroll down till you find the Add comment field to begin typing. 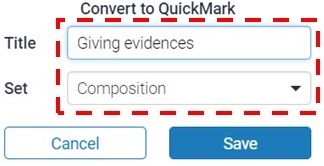 Click on the paper and select the QuickMark icon to choose a QuickMark to leave on the paper. Continue the steps 2&3 above. Click on the paper where you would like to leave your comment, then click the speech bubble comment icon. Type your comment in the Add Comment field, then highlight the text you wish to format using the formatting tool to bold, italicize, underline, or hyperlink. Press outside the comment box to save your text. This is how your comment appears. 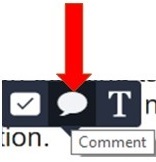 Select the part of text you would like to associate the comment with & click the speech bubble icon. Click the blue bubble comment. Click the trash can icon in the bubble comment box. To reuse these bubble comments into this assignments or other assignments, you can convert them into a QuickMark. Click Convert to QuickMark in the bubble comment box. Set a title and assign the QuickMark to a specific set, then Click the Save button. Your QuickMark will now appear on the paper. 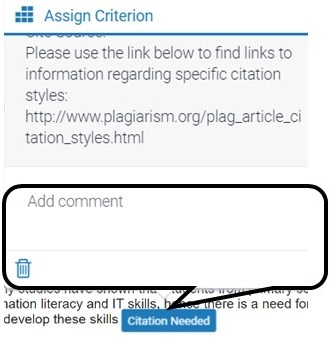 The Assign Criterion option will only appear within your bubble comment options if a rubric or grading form is attached to the assignment you are grading. 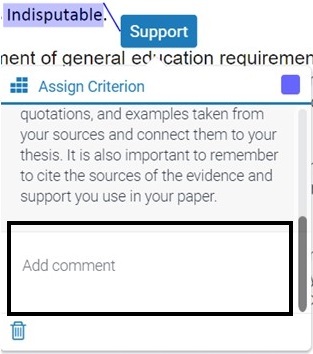 Click the Assign Criterion button, a list of your rubric or grading form's criterion will appear to choose one of them to your bubble comment. The bubble comment icon will be displayed with a rubric icon inside it. 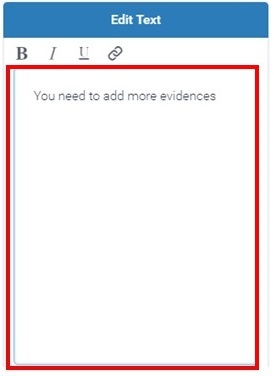 Click anywhere on a paper & choose the T icon from the in-context marking tool, then type your comment. Your inline comment will appear like this. Note: You can move a comment by clicking and dragging it to anywhere on the paper. Hover over the comment with your mouse. Click the trash can icon that appears above the comment. Instead of using Inline comments, you can strikethrough a piece of text. Highlight the text, then click the S icon. Your text will appear like this. To remove the strikethrough from your text, hover over the text with your mouse and click the trash canicon that appears above. A voice comment can be recorded using your computer's microphone and it's up to three minutes long. Click the Feedback Summary icon from the blue grading toolbar. During recording, the record button will change to a || pause button, click pauseto pause the recording temporary or click the record button to continue. If you have finished, click theStop button. A text Summary Comment is used for providing an overall feedback on a paper. The Feedback Studio toolbar offers rubrics and grading forms within the grading service. Rubric scorecards are used to evaluate student work based on defined criteria and scales. Standard rubric - allows you to enter scale values and criteria percentages. Custom rubric - allows you to enter any value directly into the rubric cells. Qualitative rubric - allows you to create a rubric that has no numeric scoring. Click on the Libraries tab located above. Click on the Rubric icon from the blue grading toolbar. 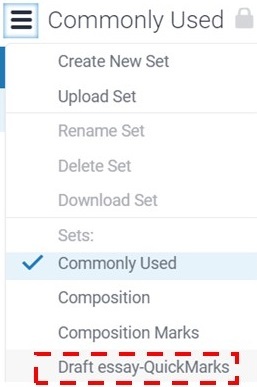 Click on Edit assignment settings. Scroll down and click on Launch Rubric/Form Manager. Click the cog icon in the Rubric/Form side panel to open the Rubric and Form Manager. Click the menu icon in the top left corner of the Manager and choose "Create new rubric". 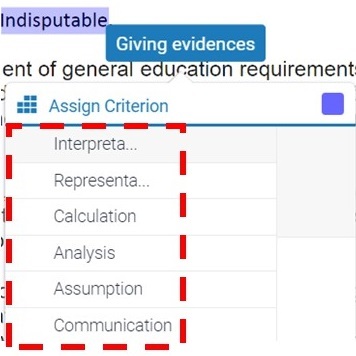 Click on the Scoring link in the top right-hand corner of the Manager to identify the rubric type: Standard, Qualitative or Custom them enter a name for your rubric by clicking on Enter rubric name here. To save your title, click anywhere outside of the text field. To add either extra rows of criteria or scale columns , click on the + icon. To enter the scale title or value / edit the name, description, or percentage value of a criterion, click directly onto the relevant field and type. Press enter or click anywhere outside of the text field to finish editing. 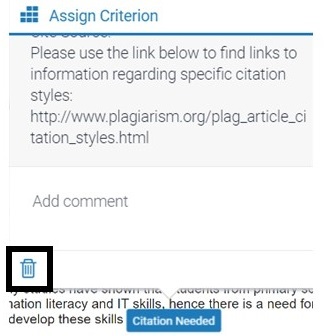 Once the rubric is complete, click Save at the bottom right and click Off next to Attach to Assignment to attach it to the assignment, then click Close. Rubrics that have been attached to an assignment cannot be edited. Duplicating a rubric helps instructors reuse a rubric that they would like to modify. 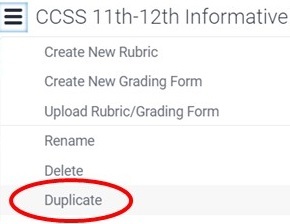 Click the menu icon in the top left corner of the Manager and select the rubric you would like to duplicate from the list of rubrics. Click on the menu icon and then select Duplicate from the drop down menu. Click the menu icon in the top left corner of the Manager and click the Upload Rubric/Grading Form. 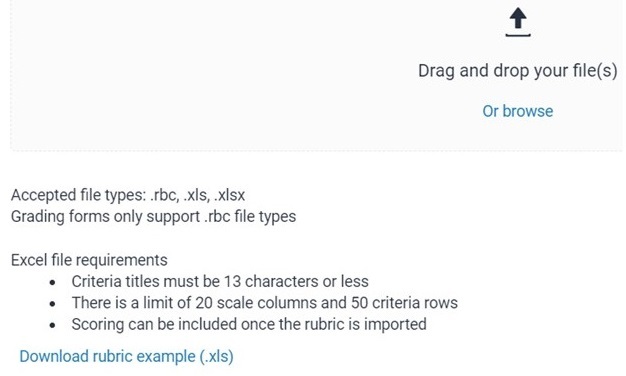 To upload your rubric or grading form(s), you can either drag and drop your file into the Rubric and Form Manager or you can browse your computer to select the file. Note: check the file requirements for uploading rubric/grading forms. Once your file has uploaded successfully, click the Open button to open the rubric in the Rubric and Form Manager. By moving the sliders, scores can be assigned for each criterion. 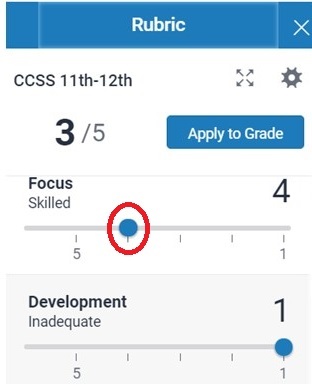 Click the Apply to Grade button will show the total grade of the assignment. The chosen rubric will appear on the right of screen..
Set your score using the rubric sliders. Move the blue circle to the correct score or click directly on the score you'd like to give. Once you have set all scores, click Apply to Grade. The total score of the paper will appear. To continue grading another student papers, use the navigation arrows in the Feedback Studio, or use the navigation drop down list to select a specific paper. This will automatically change the paper you are scoring. Click on the expand rubric icon to the right of the currently selected rubric title. 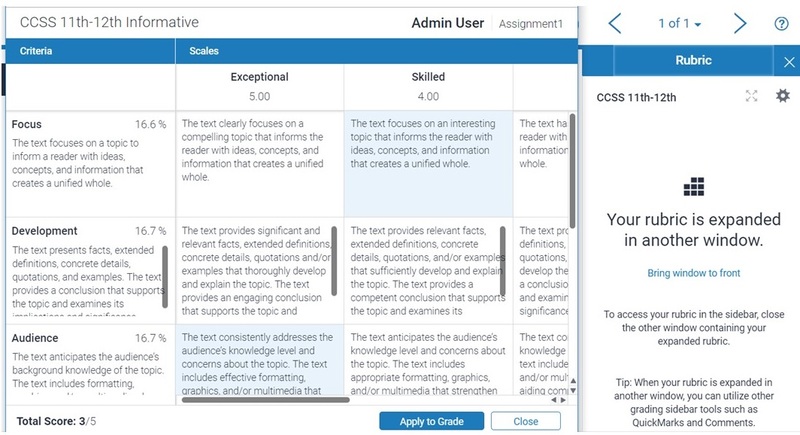 The expanded rubric will be displayed in a full size in order to allow instructors to easily click a criterion description to give your student a score for that criterion then click the Apply to Grade button at the bottom to apply the score to your student's grade.